From the beginning of January you can see, especially on week-ends, disguised groups rehearsing in the streets, singing, dancing, making collections between the passers-by to be able to finish their costumes. These preparations culminate in the last "fat" days before Lent, when from Shrove Sunday to Ash Wednesday work rests and carnival is at its frenzy. 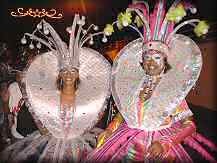 The biggest parades being in Pointe-à-Pitre and Basse-Terre, but you'll live carnival in every town and village. On Shrove Sunday the streets fill with carnival's buffoons, parades and masquerades take place. The carnival groups can finally show the result of their efforts and parade by foot or on floats in colorful disguisements - following a different theme each year. Shrove Tuesday starts with morning parades for everyone in pajamas, followed by parades all day long and late dancing. Ash Wednesday: on this last day of cheerfulness the streets are full of black and white he- and she-devils. The evening points the end of carnival with the "Grand brilé Vaval", cremation of King Carnival "Vaval" accompanied by the crowd's cries and wailings. The day ends with late dining and dancing, for the last time the Ti-Punch flows abundantly. Mid-Lent Thursday, half-time between carnival and Easter, is a day in Lent where carnival revives: it is the day of red and black devils. 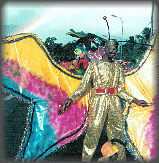 The events of Carnival - click here!